This year's Labour conference has agreed to recognise Palestine as a state, freeze arms sales to Israel and fight for the right of return. Ben Jamal looks at what's ahead. In August this year, Palestinian civil society took the unusual step of writing directly to the Labour party. Their message was clear: do not allow our voices to be silenced and our history to be erased. The remarkable scenes at Labour conference last week showed that the party hears Palestinians’ voices, recognises their history and stands in full solidarity. The Palestinian letter was written in the context of concerns about how the IHRA definition of antisemitism is being used to prevent the facts about Palestinian dispossession being brought into the public domain and, more broadly, to attempt to demonise solidarity with the Palestinian people. It called for Labour to unequivocally uphold the UN-stipulated rights of the people of Palestine: the right to be free of military occupation, the right to full equality for Palestinian citizens of the Israeli state and the inherent right of Palestinian refugees to return to the homes from which they were ethnically cleansed during the ‘Nakba’ (catastrophe), and ever since. 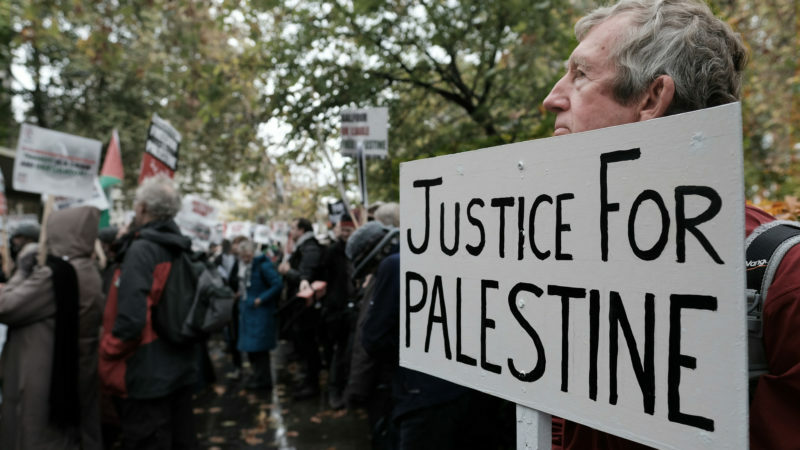 Last Tuesday, the Labour conference responded with an unprecedented display of support for the cause of justice for Palestinians. For the first time in living memory, the conference debated – and overwhelmingly passed – a motion on Palestine. A sea of Palestinian flags distributed by the Palestine Solidarity Campaign underlined the message that Labour stands with Palestinians in memorable and historic fashion. The motion passed at conference, after moving speeches by delegates Colin Monehen from Harlow, and Zahid Ali from Wolverhampton, recognised the expulsion of 750,000 Palestinians during the Nakba as historical fact. Monehen also made pointed reference to this truth and condemned the Trump administration’s attempts to remove the right of return from the table, after a request from Benjamin Netanyahu, in violation of international law and principles of natural justice. Labour members’ solidarity was not only symbolic but had clear policy implications. As well as recognising the centrality of refugees’ right of return to any resolution in Palestine/Israel, the motion also endorsed a freeze on arms sales to Israel. That Labour’s grassroots should support such a move is hardly surprising. It was a response, as the motion noted, to the fact that the Israeli military has killed more than 170 unarmed Palestinian demonstrators in the Great March of Return in recent months and maimed many thousands of others. A picture of 21-year-old Palestinian Razan al-Najjar, a volunteer nurse shot and killed by an Israeli sniper while assisting the wounded in Gaza, was held aloft by Zahid Ali when he seconded the motion. The astonishing scene of the conference hall filling with Palestinian flags in response – and chants of ‘free Palestine’ ringing out – made plain the passion with which Labour delegates support the Palestinian people. The Palestine Solidarity Campaign had declared Tuesday a day of solidarity and Labour members responded en masse. This was the Labour grassroots saying with one voice “we will resist all attempts to silence Palestinian voices”. It was a direct response to Jeremy Corbyn’s call at the last Labour conference for the party to give “real support to end the oppression of the Palestinian people”. Outside of the main hall, every meeting held at the fringe on Palestine was packed to the rafters. The desire of the vast majority of Labour members for solidarity backed by meaningful policy and action was asserted in an unmistakeable way. So what happens now? Labour members will return to their constituencies and must keep passing further resolutions on freedom, justice and equality for Palestinians to keep the grassroots pressure on the leadership. The mandate for an arms embargo must be converted into a Labour manifesto pledge. For while the UK government continues to arm Israel, we remain complicit. But we can, we must, and we will change this.